Beethoven wrote his piano concerto in C major during 1796 and 1797 soon after he had taken up permanent residence in Vienna. At the time he was already recognised as one of the greatest pianists in Vienna, and he was seeking to advance his reputation by touring throughout Europe. The concerto was one of a number of works that he wrote for himself, and he gave the first performance in Prague in 1798. It was the first of his piano concertos to be published, but the third to be written. He had composed a concerto in Eb major at the age of 13, of which only the piano part has survived, and had completed a version of his second concerto in Bb major as early as 1785. The C major concerto, while showing a distinct influence of Mozart and Haydn, particularly in the use of form and instrumentation, contains strikingly original touches of colour and drama, such as off beat sforzandos and unusual shifts of key, which give it a unique Beethovian character. Beethoven, who was highly self-critical, held the opinion that neither the first nor second piano concerto was among his best compositions. Compared with other works of the same period, such as the six string quartets Op18 and the first symphony, it has attracted little attention from the critics. Nevertheless, the work is one of great poise, elegance and subtlety, and stands high in the canon of his achievement. It represents an important landmark in his development as a composer. It was the longest and grandest work written for orchestra before the first symphony, and in it he explores some new and brilliant orchestral effects, particularly in the string parts. Compared to contemporary concertos, it is a long work (depending on the cadenza it can 40 minutes long). The first movement is in sonata form, and opens with a simple march-like theme which starts tentatively, but gradually gains strength and confidence. The contrasting second theme, which is introduced by an inner voice from the second violins, is much more lyrical and is based on a beautiful flowing melody. The exposition ends with another march-like section, returning to the opening idea with great confidence and grandeur. The entry of the piano is a masterpiece of understatement. The soloist plays a new idea, quietly and unassumingly, almost giving the impression that he or she has not been attending to the orchestra. This new idea is elaborated briefly before the orchestra rudely interrupts with the opening theme, and the repeat of the exposition proceeds with the soloist in virtuosic dialogue with the orchestra. The short development section contains a wonderfully mysterious series of pianissimo descending scales played by the soloist. Both the repeat of the exposition and the recapitulation contain many other highly effective developmental ideas, extending the length of the movement and foreshadowing the techniques of his later works. Beethoven wrote out three possible cadenzas for the movement, of differing length and difficulty. The second movement is in the remote key of Ab major. It is a simple ternary form (ABA), but like the first movement it does not simply repeat material but rather gives the listener the sense of a story unfolding. The melodic material is very beautiful and restrained. The final movement returns to the home key of C major and is a seven section rondo (ABACABA). In many ways it is the most conventional movement of the work, but still it has many original ideas, and is filled with infectious energy and exuberance. On each entry, the rondo theme is first stated by the piano, then repeated, forte, by the whole orchestra. It appears in the same key on each occasion, and is only varied at its last appearance. The first episode is introduced by a perky little fanfare on the woodwinds, and contains more dialogue between the soloist and orchestra. On its second appearance it is varied by delightful harmonic shifts and changes in orchestration. The middle episode is softer and uses the minor mode. There is a short cadenza before the final appearance of the rondo theme. The work closes with a brilliantly original coda, in which the piano part gradually becomes quieter and slower, and with the same understatement of his or her entry in the first movement, the soloist departs almost unnoticed with a few bars seemingly improvising on the theme. The oboes say a sad farewell and then the whole orchestra closes the movement with a sudden short blaze of colour. 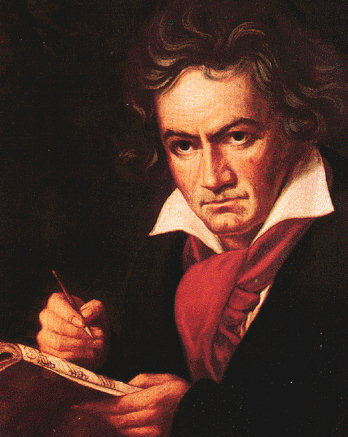 Beethoven's first piano concerto was be performed on the 10th July 2010 by Anton Lyakhovsky accompanied by the Portobello Orchestra conducted by Anthony Weeden.